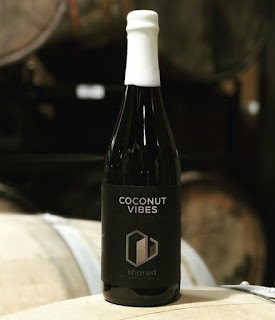 Can you believe we are getting some Shared Brewing Barrel Aged Coconut Vibes from Side Project Brewing! A huge, huge thank you to Cory, Karen and family! Release details....Just a few days away! Will be released Monday, February 25th, so that emails can go out on Sunday the 24th. We will have some other Side Project news throughout the year, but right nothing is set in stone and we are sworn to secrecy. Trust me, we will post info as soon as we can. 30 bottles will go through a weighted random drawing of everyone in the BRC that purchased a bottle of Side Project Merci from one of our stores of the current batch going back to its release in September 2018 until Saturday February 23rd. For each bottle you purchased it will count as a raffle ticket. This way we can reward Side Project supporters. Looks like there are 389 BRC members that have at least 1 raffle ticket in this category currently. 24 bottles will go the top purchasers in the BRC all products included (whiskey, wine, cheese, beer...). Based on last 6 months through Feb 23rd. That leaves 26 bottles we will use for tastings and surprise bottle releases later. Only 1 bottle per person, if you get picked in multiple categories above, you will still only get 1 bottle, we will just go to the next name. You must have been a member of our BRC before February 11th, 2019 to qualify for this release. As always, you will be able to pick up at any of our four locations if you receive an email for this release. Release date and details subject to change if there is a need or a conflict.